Adams Elementary School Students and Teacher join in at the Where Art Lives Opening Ceremony. Photo by Kevin Walsh. Where Art Lives, the 2014 Young Audiences Arts for Learning National Conference has come to an end, but I am still discussing what I learned with my colleagues and planning new initiatives inspired by programs in the YA network. The Where Art Lives conference was held on Thursday, April 24 through Saturday, April 26 at the US Grant Hotel in the heart of downtown San Diego. It would be hard to list all the incredible breakout sessions, speeches, and cultural activities that I participated in those past three days, but here are the highlights. 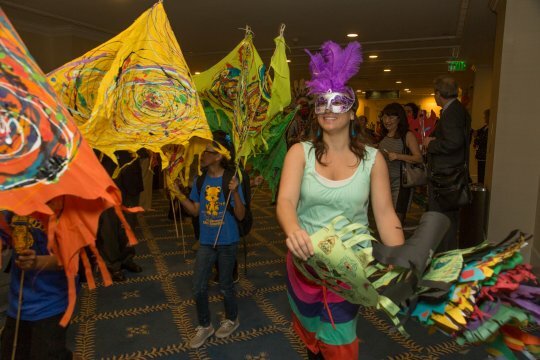 On Thursday, April 24, the conference kicked off with a parade that included stilt walkers, musicians, teachers, arts education professionals and students from the Adams Elementary School in San Diego. The parade circled the historic U.S. Grant ballroom in celebration of the conference and trust me, few attendees expected this lively of an opening ceremony! Welcome remarks were given by the National Board Chairman, Corinne Greenberg and National Executive Director, David A. Dik. They were followed by a special guest, San Diego Congressman, Scott Peters who thanked Young Audiences of San Diego for their invaluable work in the San Diego United school district. Keynote Speaker Alfie Kohn. Photo by Kevin Walsh. 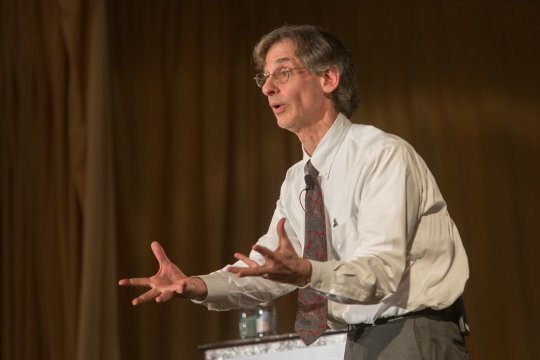 We were then treated to a keynote speech by Alfie Kohn. Kohn's remarks were more controversial than I was accustomed to, he began by asking us to take a more critical look at some of the popular education topics like the CCSS, STEAM, and early childhood education. One reoccurring theme he mentioned was how the arts suffer from a collective inferiority complex because often the arts are classified as a non-essential enrichment. It is an interesting and provocative idea that arts advocates are always pleading to be allowed to sit at the grown-ups' table. His thoughtful, but controversial keynote speech was a success and I witnessed a great amount buzz and debate from the conference attendees. Whether we agreed with him or not, he got us to think about our passion and our mission of inspiring young people and expanding their learning through the arts. The marathon day ended with the conference event on the Berkeley Steam Ferryboat at the Maritime Museum. The Where Art Lives attendees feasted on delicious hors d'oeuvre and danced to the festive African pop music of Bolga Zohdoomah. Even though the Ferryboat never left the dock, I explored multiple historic naval vessels including a decommissioned submarine!  We would like to thank the NAMM Foundation for their support of this event. Maritime Museum Event. 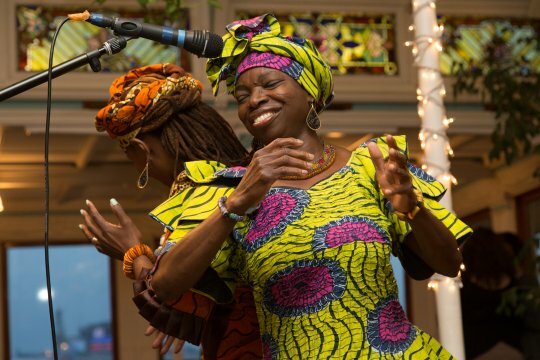 Dancing to African pop music by Bolga Zohdoomah. Photo by Kevin Walsh. Friday was another action packed day; we started with two rounds of breakout sessions. Among the topics discussed were fostering and sustaining school, community and organizational partnerships, the launch of the new National Core Arts Standards, and a session that explored grass-roots arts advocacy. During the Young Audiences of San Diego 50th Anniversary Luncheon that honored four funding patrons, Cindy Marten, the Superintendent of San Diego Unified Schools, delivered a keynote speech. She spoke of her 25 years as a school classroom teacher and why she chose to work in one of the most challenging schools in San Diego Unified. Conference attendees ended the day with a site visit of their choosing. 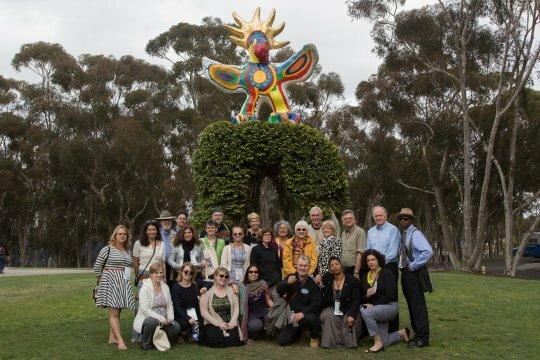 The site visits included the must-see murals of Chicano Park; the gardens and museums of the beautiful Balboa Park; and a tour of the newly built San Diego Library. I opted to see the four cultural institutions in Balboa Park - the Museum of Photographic Arts (MOPA), The Old Globe Theatre, a Civic Youth Ballet Studio which included a brief performance by some of the students, and a tour of the San Diego Museum of Art. As you can see, it was a great conference and I would like to thank the Young Audiences of San Diego staff for all their hard work organizing this year's conference.